Forget about the pithy battles in Ukraine. The sudden takeover of much of northwestern Iraq by forces of the Islamic State in Iraq and Syria, better known as ISIS, has caused investors to bid up the cost of Brent Light Sweet Crude and, in particular, the domestic crude oil, West Texas Intermediate. The result for U.S. drivers is the momentary decline in gas prices has reversed, and with crude oil prices spiking at record levels, wholesale gasoline prices have already followed suit, leading to an anticipatory hike in retail gasoline prices that is already affecting American drivers. The U.S. Energy Information Administration’s latest weekly survey of retail prices shows the average gallon of unleaded gasoline in the U.S. is up two cents, back to the $3.69 level it was two weeks ago. While the weekly rise was not as severe as some week-over-week price hikes experienced this year, it is a portent of things to come, particularly when one examines the crude and wholesale futures markets at the New York Mercantile Exchange, NYMEX. The price of crude oil has spiked well above $106 per barrel for WTI, and traders are bidding the price closer to the $107 mark, a level not seen since 2011. That is a price point not uncommon for overseas crude oil, notably Brent, which is now above $112 per barrel, a level not seen since last year. The more immediate impactor for consumer gas prices is the wholesale futures index. Reformulated oxygenate blends, RBOB, were trading nearly $3.08 per gallon on NYMEX Monday, which is about seven cents per gallon more than the previous 2014 high point on May 19. The reasons are clear: Investors fear major supply disruptions from Iraq at a time when global demand is increasing. What is the crux of all these numbers? If the trends over the past year continue, consumers will feel a pinch at the pump within ten days, with the weekly fuel survey reflecting a major spike in gas prices by the end of June. TurnpikeInfo.com’s research of RBOB shows retail prices tend to lag about 10 – 14 days behind the wholesale future prices, when looking at the trend lines adjacent to each other. The problem could be worse in some regions and cities, in particular, where fuel costs are known to be highly volatile. For instance, Ohio has been enduring wild swings in gas prices for weeks, and the latest survey shows another 6¢ per gallon increase during the past week. Two states away, in Chicago, the cost of gasoline lurch upward by 8¢ per gallon, to $4.09. 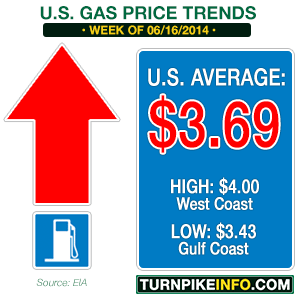 That erased price drops in recent weeks, and even stacked on additional costs for consumers. Even price declines in some states, where seasonal travel actually slows at this time of year, notably Florida, recent declines of gas prices continued but slowed. On a region-by-region basis, consumers were generally paying at least the same, and often more, than they did last week.